Since almost 4 years I have been trying to visit all the Hoysala architecture temples, trying to photograph and document as much as possible. I have developed a great affection towards Hoysala architecture and I find every temple absolutely interesting and remarkably great. Here is one more from my recent visit with my family to this wonderful Hoysala masterpiece. Doddagaddavalli is about 20 km from Hassan. The Lakshmidevi-temple found here is a small and modest monument, placed in the centre of a walled courtyard that forms a perfect unity with the temple. Embedded in the walls, four small shrines are placed at the corners of the courtyard. It especially is the fine ensemble that makes the temple very rewarding for a tourist visit. The monument dates from 1113 AD and is situated in rural surroundings on the shore of a tank. This is one of the earliest known temples built in the Hoysala style. The building material is Chloritic schist, more commonly known as soapstone. 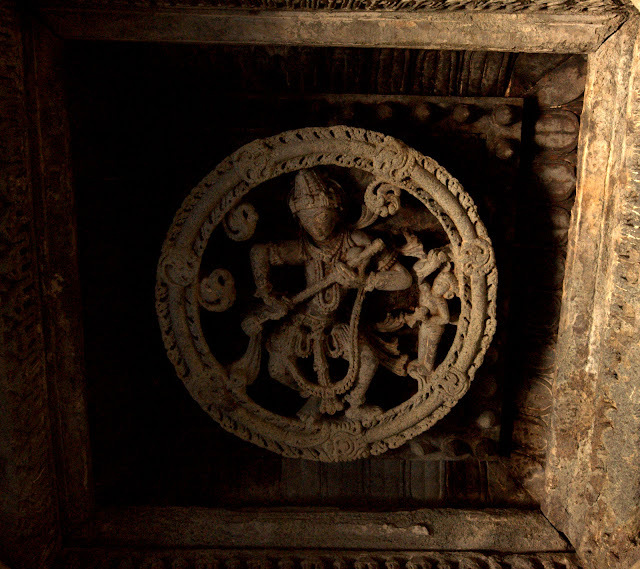 The temple does not stand on a jagati (platform), a feature which became popular in later Hoysala temples. The temple was commissioned by a merchant called Kullahana Rahuta and his wife Sahaja Devi. Mantapa at the entrance of the temple. Looking west. Entry to Lakshmidevi temple through this beautiful mantapa. The plan of this temple is very unique, because it has four shrines placed around a common centre. Three of them share a small open hall, and at the fourth side of the hall there is an oblong extension providing two lateral entrances to the temple and connecting it with shrine number four. All shrines have a nose and, inside, a corresponding vestibule, but the fourth shrine only has a a small one with thin walls. 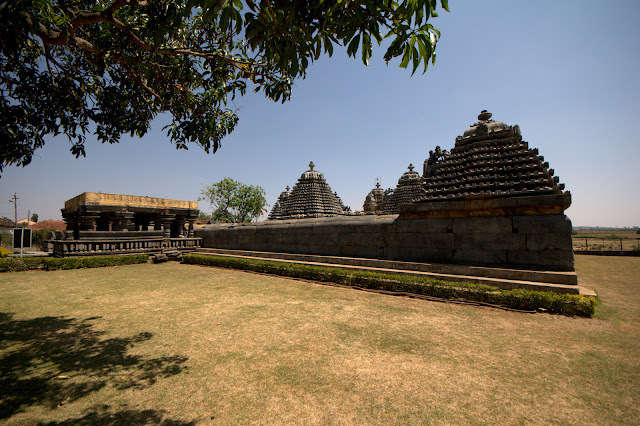 The latter is exceptional, for it is rare in Hoysala architecture that temple parts are only half-present. Also the hall is exceptional here, for it is open and nevertheless has a square ground-plan: because all four of its sides have temple parts attached to them, no staggering side remains. One of the four shrines connecting the other three to the same hall. Unique 4 garbha-gudis connected to the hall. 4 shrines that are interconnected and the independent 5th shrine. Looking East. Kadamba shikara to the left with kalasa on top. Simple structure of one of the shrines seen from the rear side. Only a few meters from the main temple there is a fifth shrine; together with its vestibule it stands free and faces of south. Though coarse in execution it belongs to the original design of the ensemble. 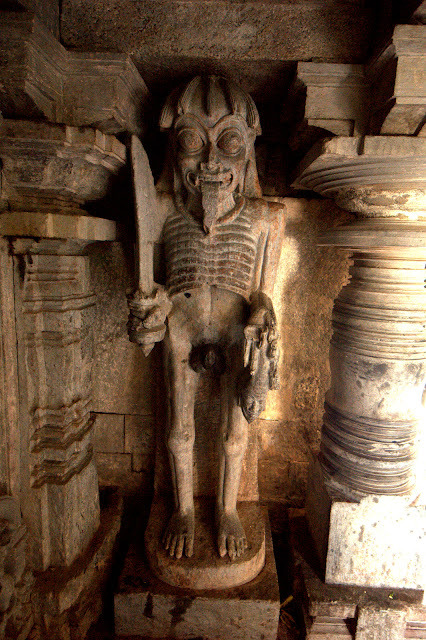 It is dedicated to Bhairava, a terrifying form of Siva. Not seldomly a separate simple Bhairava shrine like this one is added to a temple; mostly it is so simple as to have a superstructure at all, but here it has a tower and a nose, both of them complete with kalasa and Hoysala crest. Smaller shrines at one of the 4 corners. Finally there are still four more shrines, small ones situated in the corners of the courtyard, with two of their sides embedded in the compound wall. 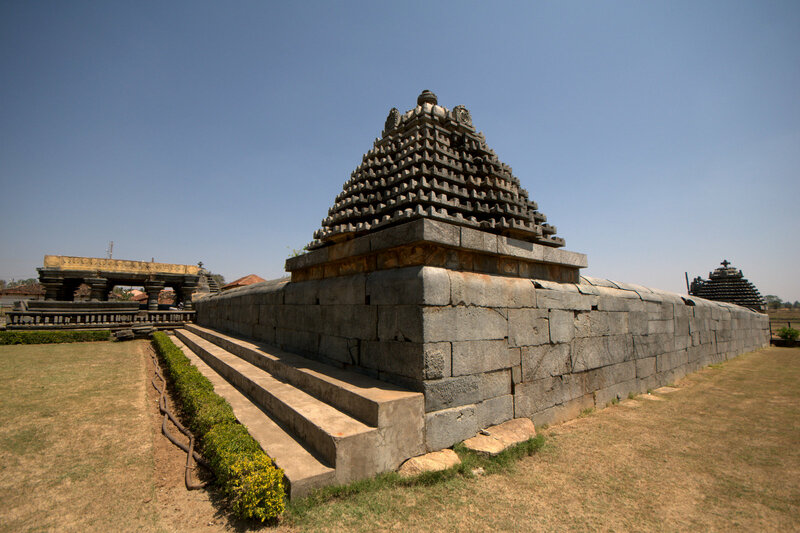 Also these four shrines each have a superstructure complete with kalasa and Hoysala crest. The plan of the ensemble is completed by two entrances across surrounding walls; in the eastern wall there is a large one, which is a complete building similar to an open hall, and in the western wall, there is a small one being framed opening only. The overall character of the ensemble described now is very fine, the more so because the pavement of the courtyard is of the same kind of stone as all the elevated parts. Hence altogether the ensemble shows nine towers, all of them with nose, and all of them with kalasa and Hoysala crest. Pillar inside the temple illuminated with the light from outside. Mantapa inside the temple that connects the three shrines. Wide-angle shot of the corner shrine and the mantapa at the entrance. The photographs are excellent, as usual. You must have arrived late morning that gives the light contrasts. The one I liked most is the Kadamba Shikara. The angle of the photograph and the light/shade contrast is just great.